The great dog river runs from Richmond right up the Roxborough / Bloody Bay Road. It passes right through the rain forest but is difficult in parts to navigate and this one definitely needs a guide. However where the road ends, the river provides an ideal place for a river lime. You get to it by driving along the Windward road through Glamorgan, coming down the steep hill to the Water Authority works at the bottom of the hill. Turn left here and follow the narrow road. This crosses the river at two fords. Passing through the fords the road winds it way through bamboo and open country in which there are always several grazing cows. Do not look for anything more organic than these beasts. Their meat can be bought in Scarborough Market on a Friday or Saturday! The metalled road eventually gives out and becomes a dirt track. 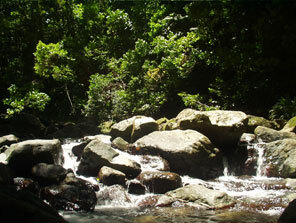 Park in the stand of cocoa trees and continue on foot to the river, carrying with you your food and drink. You can easily walk up the river here for some distance, shaded comfortably by the bamboo and with cool feet thanks to sloshing your way upstream! There are a lot of birds here, Parrots, Sothern Lapwings, Sandpipers, Jacamars, Motmots, Anis, Tanagers, Antshrikes, Kingfishers and Herons, all these can be seen along this stretch of river. However for the river lime there is a wide sandy bank along side the river right after where the road meets the river. The river at this time of year is small and clear but there are deep pools to swim and laze in whilst waiting for the food to cook or the beers to get cooler! Stones are available to make the three stone fire and there is an abundance of old bamboo to light the fire with. Beware of flying sparks as the countryside is very dry and would require very little to set the bush afire and once that starts there’s little stopping it! For the food and drink, have a look at Harriet’s cookery page. Don’t forget the big iron pot to cook the food in! And there you have it, all the ingredients for a really wonderful afternoon at the river, the right people, the right food and the right drink, and you are ready for a river ‘lime’! The word lime probably stems from the poor English sailors (known as limeys because they ate limes to counteract scurvy) during the Second World War and who had no money unlike their American counterparts. The British had given the American’s a base in Trinidad in exchange for some much-needed submarines. The limeys congregated outside the bars sharing a beer and a cigarette whilst their American counterparts were inside spending freely and imbibing to their hearts content. The result was that the limeys were said to be ‘liming’! Nowadays we have a ‘lime’, the getting together of a group (often known as ‘the lime’) to share food and drink and talk and talk and talk. Then there are ‘limers’, those people who try to spend as much time as possible ‘liming’ and there is the act of ‘liming’ which is basically doing it!